Airflow Caravans produce the ideal caravan for people with special needs and disabilities or those requiring a toy trailer or a family van with all the luxury inclusions. For more information call 07 4642 0078 or visit the Airflow Caravans website. You can also contact Airflow Caravans by online by clicking on the Submit Enquiry button on the right and please tell them that you have seen their photos on Caravan Park Photos. 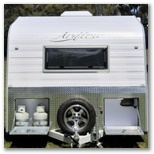 Photos on this page were supplied by the Airflow Caravans in March 2010.